100 BPM is a concept that helps to save lives by greatly increasing the success rate of administering compression-only CPR (cardiopulmonary resuscitation) to an adult after a cardiac arrest. It does this by giving the rescuer tangible and intuitive feedback through sound and light, for the two most important factors for success of the procedure: compression depth and frequency of the compression. 100 BPM uses light to create a depth scale illustrating compression depth, and a 100 BPM beat for the user to follow. Sound is used not only to guide the rescuer to administer 100 BPM compressions, but to also manage the stress and emotional stages the rescuer experiences over time. 100 BPM comprises of a comfortable central silicone coated pad (housing the main electronic components), through which the compressions are given. This pad sits on a larger fabric base, interwoven with LEDs. The product uses the surface area surrounding the rescuer’s hands as an interface space, which is easily visible when in use. Rows of LEDs form an intuitive depth scale surrounding the hands and illuminate in yellow (for too shallow), green (for correct depth) or red (for too deep). Performing resuscitation is a high stress situation where sound and light feedback can save precious time by communicating more intuitively with the rescuer to help them quickly start saving a life. Bystanders witnessing a cardiac arrest often fail to even attempt to give CPR. They are often unsure of how to do it properly, or are scared of causing more harm to the patient. Even trained persons can quickly forget the advised numbers for frequency and depth of the compression. It was decided to concentrate on compression-only CPR (which is a simplified resuscitation procedure involving only chest compressions, and no mouth breaths) because it is a less intimidating procedure for anyone to attempt, which yields more effective results from rescuers with limited resuscitation knowledge. Chest compressions should be given to a certain depth for adults: if the chest is under compressed, there will not be enough blood or oxygen flow to ensure recovery. If the chest is over compressed, there is the risk of cracking a rib and puncturing vital organs. Most compression-only CPR guidelines advise the rate of compressions to be between 100-120 BPM. If below 100 BPM, the chance of a natural spontaneous heart rhythm returning is lower. Every year, thousands of lives could be saved worldwide if more bystanders attempted to give compression-only CPR. 100 BPM will help to save those lives by supporting more bystanders through the procedure, instead of them looking on helplessly. As it is critical to start resuscitation immediately after a cardiac arrest, when bystanders do nothing it is often too late to save the patient’s life when the emergency services arrive. In a life and death resuscitation situation, the impact this product could have to all parties, from the patient and their family, to the rescuer and the emergency services is immense. It could also decrease the amount of hospital time and treatment required by the patient after the cardiac arrest, by keeping blood and oxygen pumping to vital organs, which may otherwise be damaged. 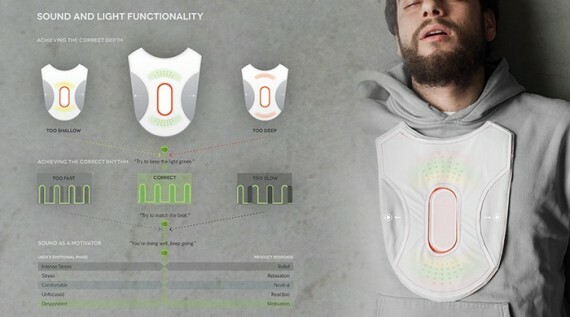 The rescuer should be able to perform compression-only CPR for longer with 100 BPM, because the product warns them when they are overexerting force into the chest (and unnecessarily tiring themselves), and also motivates them to keep going with progressive sound feedback. This extra time, even if it is for a minute or so could make all the difference in the rescue attempt. It is important to provide feedback, motivation and reassurance to those performing resuscitation, throughout all stages of the procedure. Rescuers tire quickly when giving chest compressions, and their sense of time is skewed due to stress. The rescuer giving up before the emergency services arrive is a real problem: sound was explored very deeply to overcome this. 100 BPM uses a progressive sound, starting simply as the user becomes accustomed to the task. If the user manages to match the beat, and compress the chest to the right depth consistently, the sound progresses gradually to keep the rescuer’s focus. This progressive sound considers the different emotional phases the rescuer experiences over time: initial shock and getting used to the task; followed by increasing tiredness and wanting reassurance. This was coupled with factual voice messages stating the time and a motivational message such as: You’ve been going for two minutes, you’re doing well, keep going! Considering the context, the product was made as portable and compact as possible by keeping the number of parts to a minimum, and using flexible materials, which can be folded into a smaller stored form.